Upper Cervical Chiropractic care is a very precise evaluation, analysis and specific realignment of the top two bones in the neck called the Atlas (C1) and Axis (C2). This is also termed the Cranial Cervical junction. This a similiar connection between the circuit box and all the wires that exit out the top to your entire house. This precise adjustment called Toggle Recoil is a realignment where there is no twisting or popping of the vertebra to achieve alignment of the neck. This specific Upper Cervical Adjustment (Toggle Recoil) technique was developed and highly researched by Dr. BJ Palmer in the early 1900's and the profound effects on a persons overall health. 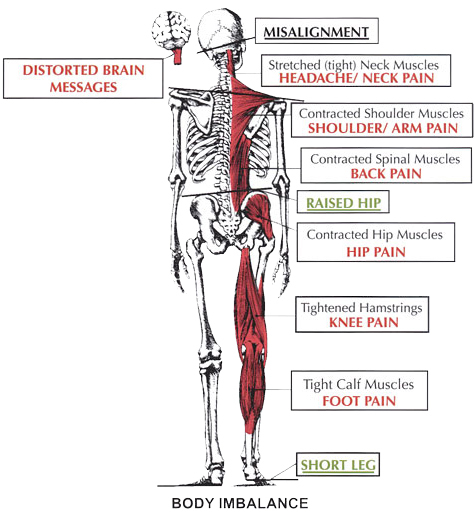 Symptoms of a misalignment include neck pain, headaches, migraines, dizziness, vertigo, balance issues, tinnitus, back pain, digestive problems, immunity and neurodegenerative disorders. 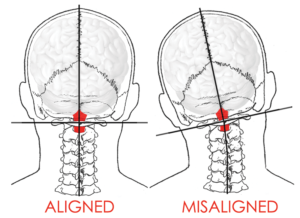 This misalignment in the upper neck over period of time can cause a vast array of health problems that can develop immediately (Injury) or gradually. The reason this occurs is because all of the essential information coming from the brain to the body is blocked right at the spinal junction (Circuit box) leaving the body at an imbalance with improper or significantly less nerve activity. This Upper Neck misalignment shifts the body and develops multiple compensations where the shoulder can be higher, the hip may drop or you may have a short leg on one side (see attached illustration). On your first visit, the doctor will consult you and examine you through a very thorough history x-rays will be taken to diagnose the upper neck subluxation (misalignment) through a cervical x-ray series. These Subluxations are caused by slips, falls, Autoaccidents, sports injuries, poor habits, toxins and of course high stress levels. After the misalignment in the upper neck is determined, a very specific chiropractic adjustment will be directed on the upper neck to remove pressure and irritation on the delicate spinal regions. This correction of the misalignment improves the function of the entire spine and nervous system without popping, cracking or twisting of the neck. At Sheppard Chiropractic, we realize that doctors don't heal, the body has an inborn ability to heal itself naturally when there's no interference or pressure on the nervous system. Dr. Sheppard's focus is to restore normal and optimal spinal function, relieving stress and reducing interference on the body and optimizing the inborn ability for yourself to heal. Healing takes time as your body is repairing itself and stabilizing through these Specific adjustments. Upper Cervical Chiropractic is a natural way to relieve the stress of daily life, recovery from injuries and nurture the benefits of better health..